Home / How to Remove Pattern & Pin Lock On Sony C3 D2502. 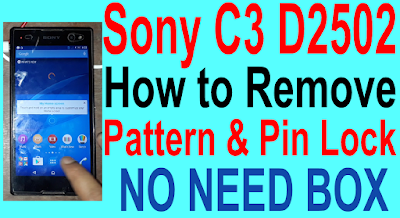 / videos / How to Remove Pattern & Pin Lock On Sony C3 D2502. How to Remove Pattern & Pin Lock On Sony C3 D2502. Sony Xperia C3 D2502 Pattern & Pin Lock Required File. 1# Download C3 D2502 FIRMWARE FILE. How to Remove C3 D2502 Pattern & Pin Lock. 2# Firmware file copy to c drive flash tool firmware folder. 3# Open sony flash tool. 4# Click flash tab and select flash. 6# Now connect phone click volume down and connect to pc. 7# Now flashing process.few mins waiting.